H&R Sport Springs almost new, perfect late e30 front bumper with rebar. Hi Guys as the title says, I have a set of barely used H&R Sport springs for sale. $ 200 firm plus shipping. I was going to use them but decided to go with a GC coil over kit. Springs were touched up to prevent rust. There is a guy interested in the front bumper BTW. The top left of the bumper got a scratch. Rear bumper sold already. Rear bumper gone already. are you selling those borbets? No they are for my car, sorry. 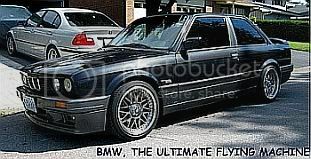 lol watch out people, chrome's scouping up all the e30 parts. Lol is he known for that Well allot of e30's are being crushed and destroyed very fast thses days so it only makes sense to keep some stuff if you have an e30 you wanna keep for a while. I have a customers rusted 90 e30 that will be destroyed soon, makes me really sad to see it go. Front bumper, rebar, bumper shocks and bumper lights all for sale complete. Every thing perfect, nothing cracked or repaired. Bumper has one scratch and a few little stone chips of course. One front signal light cracked. As promised, I am notifying all who were interested and many thanks for all the enquiries. Last edited by Striker; 02-25-2006 at 01:44 PM.